BlackRock, KKR, Silver Lake, Boston Consulting Group, and the exodus west from corner offices to the millennial paradise of Hudson Yards. Or at least that’s what they’re hoping to find. With an opening from Kravis, Blau rolled out detailed architectural models of the 28-acre project, which Related is developing alongside Oxford Properties. Blau took him for a tour of the work in progress, awing Kravis with the scale of new construction in a neighborhood that financiers had few reasons to even think about before. When we first started talking to commercial tenants three years ago, Blau remembers, they would say, What is this? Then they would ask me, Why would I put my company all the way on the west side? But 60 percent  60 percent!  of Manhattans buildings are over 50 years old. Were way behind other global money centers like London and Shanghai. Blau, 48, took over the private real estate powerhouse from billionaire founder Stephen Ross shortly after Hudson Yards broke ground in 2012. Hudson Yards was Rosss most ambitious project, but far from the first: He also remade Columbus Circle with the Time Warner Center. A few days after Kraviss site tour, he sent his real estate people to make a deal, and told his partners that the firm needed to follow to stay on the cutting edge. KKR ended up buying the top ten office floors of 30 Hudson Yards, totaling 343,000 square feet, in a commercial condominium deal. Wells Fargo Securities and Time Warner have signed on to be KKRs neighbors, and will move divisions including HBO, CNN, Turner Broadcasting, and Warner Bros.
To Kravis, Hudson Yards may simply be an expedient branding exercise or an appealing real estate investment, and likely a bit of both. A new city is indeed rising on the west side of Manhattan, leveraging Rosss thesis that millennials want to work, live, and eventually raise their families in urban areas. They want to have easy access to outdoor space and feel part of a larger  and, importantly, hip  community. 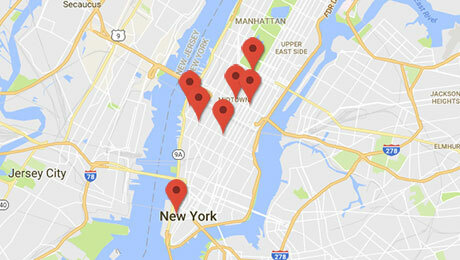 The site was the last major chunk of undeveloped land in Manhattan. Between 30th and 34th Streets, stretching from Tenth Avenue to the Hudson River along the West Side Highway, the historic rail yards connect trains to Long Island and New Jersey suburbs, as well as Washington, D.C., Boston, and the eastern seaboard. The sites value remained untapped, thanks to decades of stops and starts and dramatic political theater perfectly fitted to New York. But in this city money always finds a way. Amid the elaborate construction trains are still running. Hudson Yards will include 18 million square feet of commercial and residential space, a new subway station for the east-to-west No. 7 line, a performing arts center and theater, a charter school, and a $150 million multi-level park called the Vessel that resembles something off a Star Wars set. The Stairway to Nowhere, as The New York Times called it, will host fitness classes run by luxury gym Equinox, which is owned by Related. Dan Doctoroff, deputy mayor under Michael Bloomberg and a critical figure in New Yorks Olympics bid, came up with the name Hudson Yards. Tired of the awkward names being thrown around for the area  Midtown West, Far-Far West Side, Death Highway  Doctoroff drew a crude map one Saturday afternoon. He jotted down the areas major features, including Penn Station to the east, the Hudson River to the west, railroads, and the Jacob K. Javits Convention Center. After playing with all the different combinations of words, the best one was Hudson Yards, says Doctoroff, now CEO of Alphabets Sidewalk Labs, from his offices. They are, of course, at Hudson Yards. 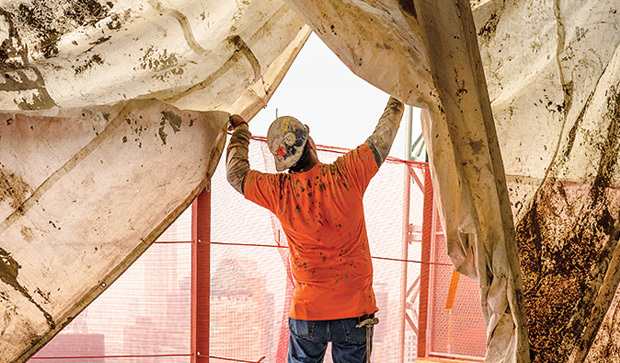 With brand-new construction  rare in densely packed New York City  companies see a chance to shed unremarkable workplaces. They envision energetic environments where everybody can share ideas Silicon Valleystyle. (Conveniently, or perhaps cynically, moving to an open plan cuts square-footage requirements if the buildings can structurally handle more people.) 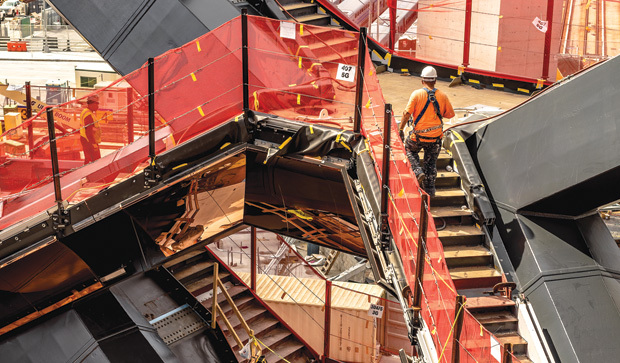 Millennials, the generation raised on video games and trained on smartphones, are the zeitgeist of Hudson Yards. Eco-friendliness and resilience are in their DNA. Financial companies, still New Yorks strongest industry, make up the largest contingent of future tenants. Hedge funds will have their own vertical neighborhood at 55 Hudson Yards. 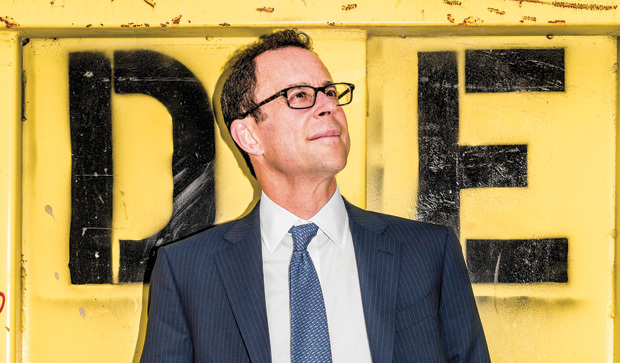 Already the rising neighborhood has drawn in Point72 Asset Management, founded by SAC Capitals Steve Cohen, and Dan Loebs $15 billion Third Point for the top floors of 55. Hudson Yards is creating winners and losers. 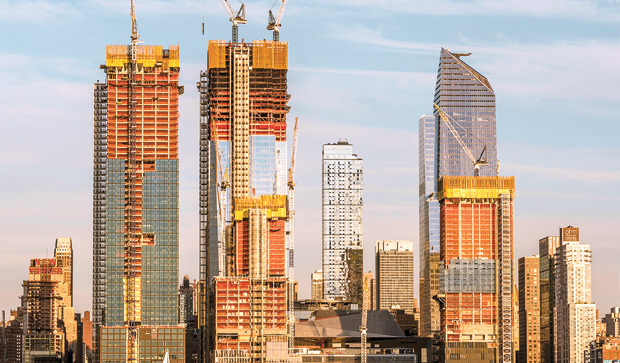 Companies that have signed on to Hudson Yards are clearing out of other areas of the city, from trophy properties to generic commercial buildings slapped up in the 1960s and 70s along Sixth Avenue, as well as parts of Lexington and Third avenues. Real estate experts say that for the first time marquee names are leaving marquee buildings on the east side and going south and west. Landlords will have to spend hundreds of millions in upgrades or discounts to keep their spaces leased, experts say. When Related was working on financing for 30 Hudson Yards at the end of 2015, Blau said his biggest risk was that Sheldon Solow  owner of 9 West 57th Street  would die and an institutional buyer would make a major capital investment to upgrade the fading property. And then we would have real competition, he laughs. But Solow, at 89, is still kicking. Hudson Yards picked off some of the buildings anchor tenants, including Silver Lake, a technology-focused private equity firm. Niceness, or at least the veneer of it, matters in New York in 2017. Visit Boston Consulting Groups new headquarters at 10 Hudson Yards, the first building to open, and bask in the warm welcome from security guards wearing eager smiles and suits handmade in Paris that pull in the patterns and colors  blue and yellow  of Hudson Yards. The niceness factor  or hospitality, as real estate agents like to call it  is deliberate and in sharp contrast to some Midtown buildings, where the service tenor can be summed up as surly. 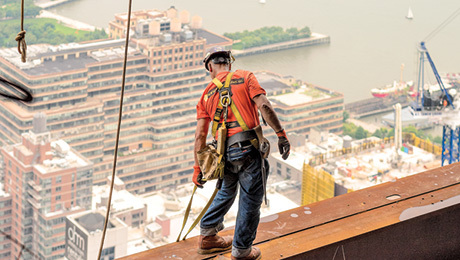 On a 98-degree summer day, Related vice president of commercial leasing Stephen Winter and Jessica Scaperotti, who once worked for Mayor Bloomberg and is now with the firms communications group, offer a dusty, hard hatrequired, private site tour. We cover blocks filled with construction workers, food trucks, and the familiar eardrum-splitting sound of buildings rising. Hovering over scale models at Relateds field offices on 34th Street, Winter is visibly animated by the heat, sweat, dirt, and noise. He points out 55 Hudson Yards, where Cohens Point72 will control the bottom portion of the building, with bond trading platform MarketAxess a few floors up and law firms Milbank, Tweed, Hadley & McCloy and Boies Schiller Flexner near the top. The building has smaller floor plates, catering to organizations like law firms and hedge funds. Winter and Scaperotti turn to the empty lot where 50 Hudson Yards will one day tower. This will be the Ferrari of office buildings, Winter asserts. Related only recently knocked down a drive-through McDonalds in Manhattan to make way for BlackRock. 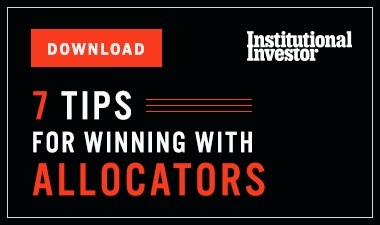 The investment giant is one of three major index and quantitative fund providers relying on data scientists, computer programmers, and mathematicians behind the scenes. BlackRock will leave its looming headquarters on 52nd Street and Park Avenue for 50 Hudson Yards (or just 50 to those in the know) when its done in about five years. COO Goldstein and Gary Shedlin, BlackRocks chief financial officer, have fueled BlackRocks move west. Goldstein, 43, also runs BlackRock Solutions, the corporate home for tech innovation. Two years ago, he says, the company starting looking hard at its business, its culture, and how to remain an edgy company and an undisputed giant. Goldstein remembers a consultant who conducted unconscious-bias training, aiming to raise BlackRock employees awareness of prejudging potential employees. The consultant showed staffers a picture of several dressed-down men with long hair, together channeling Jefferson Airplane. Then she asked the group if they would have met with the men, given the option. The men in the photo were Bill Gates, Paul Allen, and fellow Microsoft founders. Before striking out on their own, Gates and Allen had lobbied for a meeting with IBM to present their ideas. IBM turned them down, a notorious decision that haunted the company for decades as personal computers took off. BlackRock, Goldstein vows, will not make such a mistake. One hundred percent of the time, we would have met with those people, he asserts. But what I worry about is, would they want to meet with us? BlackRock is moving to Hudson Yards to reassemble its people from 31 floors and three buildings, and together rethink everything from the color of the furniture to how project teams can plug in and temporarily work together. Leaders also look forward to being in a neighborhood that doesnt shut down at night and offers more than just a few restaurants. Space is really important. If youre honest, its a big part of peoples first impression, whether its a client or a recruit. Its not simply about millennials, says Goldstein. BCG executives were skeptical at first that where a company works could help the way the company runs. Ross Love, the Australian executive quarterbacking BCGs move, says, We wanted to do a dramatic culture change, and thats hard to do in a traditional Midtown building. Space is so important. That was an extreme view to take at the time, but I think were bearing it out. The consulting firms open space at 10 Hudson Yards features sweeping views of New York Harbor, a breakfast and lunch bar, baristas, couches, cubbies, and a lot of buzz. BCG gets 2,000 visitors a month at its new digs, according to Love, roughly a 100-fold boost in tourism. Forty-four percent of its road-warrior consulting staff is in the office one to three additional days a week since the move. BCG also wanted clients to want to work from its offices versus hotel lobbies. But these figures shroud certain inefficiencies wrought by the move west: specifically, the extra 20 minutes or so required to get there from most anywhere. Based on about 100 trips, I estimate that about 20 percent of cab drivers know where Hudson Yards is, Love quips. Nothing was exactly as it should be in the saga of the development of the West Side rail yards, which arguably started in the 1950s and frustrated three New York City mayors, from Ed Koch to David Dinkins to Rudolph Giuliani. It was New Yorks bid for the Olympics that started in the mid- to late 90s that set the stage for Hudson Yards. The stadium met with defeat in June 2005, but Doctoroff scored extensive zoning changes on a broad swath of the West Side, including west Chelsea, that allowed for high-rise construction, among other changes. At the same time, Doctorow and others championed preservation of the abandoned elevated train tracks through the district. Someone had to unstick New Yorks entrenched zoning bureaucracy before the parcel could be developed  far from the sexiest part of real estate. Rezoning was the table stakes; it got the game started. With a platform over the rail yards and the High Line, you could see a new west side form, from Times Square to the Meatpacking District, says Doctoroff. Real estate firm Tishman Speyer originally won the bid to develop Hudson Yards in early 2008. As the financial crisis unfolded, the deal fell apart, and in stepped Related founder Stephen Ross with his own plan. In late 2009, Related and Oxford Properties inked a deal with the Metropolitan Transit Authority, which owns the yard, for air rights, and invested $400 million to build the platforms that would hold the buildings. Ultimately, the two platforms will cost $1.2 billion. A shoe-less Bob Alexander, Chairman of the New York tri-state region at CBRE, starts a conversation about Hudson Yards with only a few words: Its a new city. Alexander, who has three decades of experience in New York real estate, reminisces about the one area building he worked on in the years before Hudson Yards. He leased 200,000 square feet to Manufacturers Hanover  long merged into J.P. Morgan  at 450 West 33rd Street for $17 a square foot in 1985. That was it. The only one, Alexander recounts, energetically walking around his office. Brookfield has since rebranded the once concrete-clad 450 West 33rd St.  known as Sky Rink  as 5 Manhattan West after a $200 million renovation that included removing the ice skating rink from the building. It now houses J.P. Morgans digital team. Alexander rattles off names like Neiman Marcus, which will be an anchor retailer, and chefs like Thomas Keller and modernist José Andrés, who will open a Spanish food hall. All of them have signed on to Hudson Yards. The rest of New York will have to keep up, Alexander warns. Representing Related, he worked on leases with Coach, LOréal, Milbank, Point72, and SAP, among others. 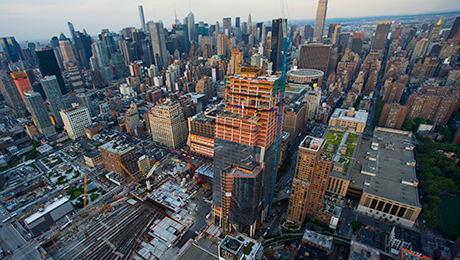 Only 5 percent of Manhattans 400 million square feet of commercial real estate is new construction. So, Alexander says, pausing, other buildings will need upgrades, elevators, lobbies, what have you. Some things cant feasibly be done, such as creating larger stairwells to support denser workplaces. Still, I once thought theyd have to throw a shroud over much of Sixth Avenue, and now many of the buildings are fully leased, he notes. CBRE says big-time renovations to compete with new construction cost between $75 and $125 per square foot. Midtown asking rents averaged about $80 per square foot as of July 2017. Posher space in the Plaza district runs about $122, down from $128 last June. Its a movement. Winter sees the westward exodus of financial firms, tailed by some big tech and law offices, emptying out of one place specifically. Since 2012 tenants occupying 8 million square feet have relocated from Midtown. Related has picked up 6.4 million square feet. 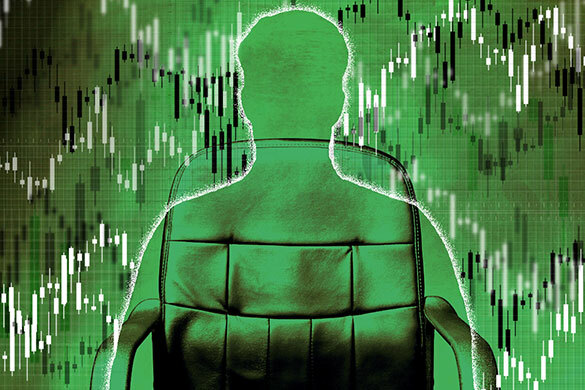 Almost ten years after the financial crisis, hedge funds, banks, and others dont want to be seen cloistered in a corner office. Hudson Yards is the beneficiary  and symbol  of that move, while Midtown will struggle to redefine itself. Hudson Yards will change things in ways we cant predict, says former Deputy Mayor Doctoroff. That could include further rezoning of Midtown Manhattan, the kind that enlivened the blocks around Grand Central Terminal, or converting tired old offices to residential and spurring mixed-use neighborhoods. Fifty years ago, who would have imagined an exploding residential population in lower Manhattan? Or, indeed, a Wall Street bereft of big finance, and a rail yard crawling in it.